Important update: visit the official minisite with the updated guide and application. The more books I read, the more I realize the importance of highlights and notes. Whether I read on paper, Kindle, iPad or iPhone, I feel the need to ‘save’ passages for later reference. Since my memory is pretty weak, I feel the need to go through my highlights now and then, but that’s something I rarely do. That’s way yesterday I came up with an idea. 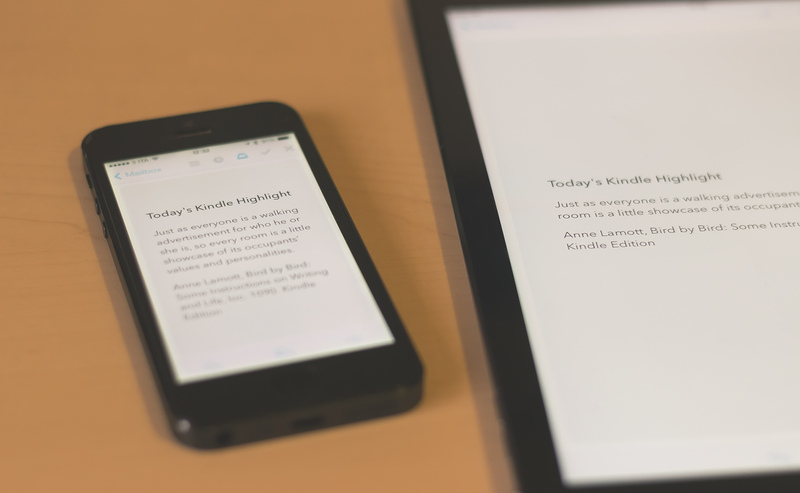 What if I received, every morning, an email with a random highlight from my Kindle books? It would definitely help me to remember important passages from my favorite books, and it would also give me some inspiration for the day. Idea: a service that shows you a random Kindle annotation (taken from those saved in your account) daily. I’d love that. …and Twitter delivered: Ryan Cooper came up with his own solution, but that is a bit too complex for my tastes. I developed a solution that is a bit simpler and doesn’t rely on paid software like Hazel. Follow these steps and you’ll receive a nicely formatted Kindle highlight via email every morning. Maybe this isn’t the best way to do it, but it’s my way and it’s working like a charm. 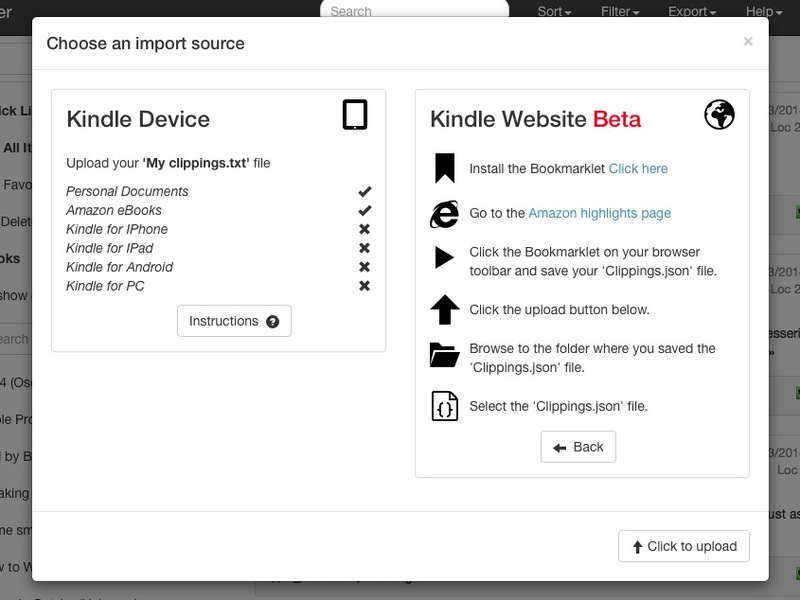 Upload your Kindle Highlights on clippingsconverter: sign up (it’s free), go to Import and follow the Kindle Website Beta instructions. It’s a very straightforward process. Create a free Evernote account if you don’t have one. On clippingsconverter, now go to Export, Evernote. 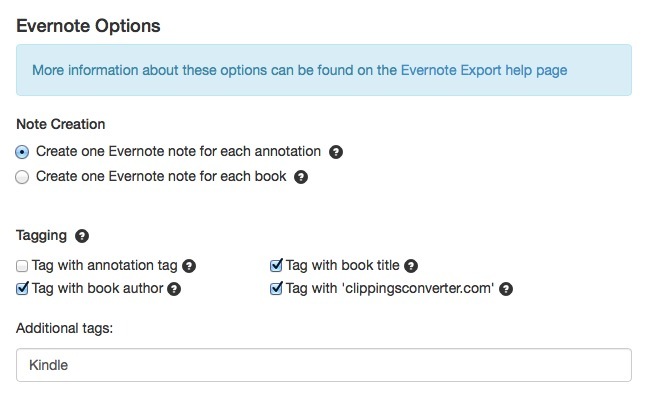 Make sure Separate content with empty line and Create one Evernote note for each annotation are selected. Before moving on, go to the Evernote page and make sure to check the Tag with ‘clippingsconverter.com’ box. Check the screenshot below to see my configuration. 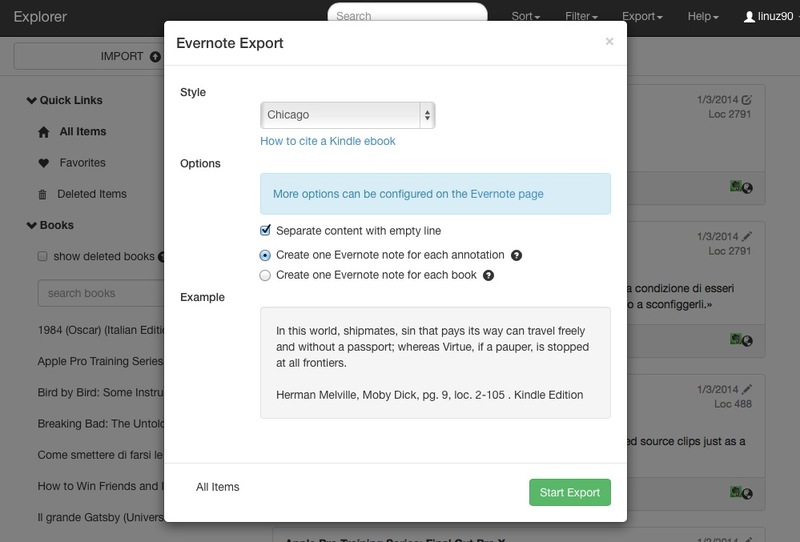 Now you can go back to the Evernote Export screen and click on Start Export. After that, go check your Evernote account/client to see if the notes are there (the sync process could take a while). Now it’s time to install the free Evernote Mac client, needed to fetch the highlights. If you’re an Evernote users, you probably have it already. Also make sure Mail.app is configured with your email account. I use Sparrow on my Mac but not everybody does, so even if you will use Mail just for this script, it’s time to configure it. Now you can download Today’s Highlight.app (version 1.1). After you unzip the file, drag Today’s Highlight.app to your Applications folder. Double click on Today’s Highlight.app. On first launch, you’ll need to choose the email address where you will receive your Kindle Highlights. After that, you will receive your first Today’s Highlight email! If you change your mind later about the email address, you’ll just need to manually edit the KindleTodayHighlight_config text file in your Documents folder. There are lots of ways to make the app run every morning. 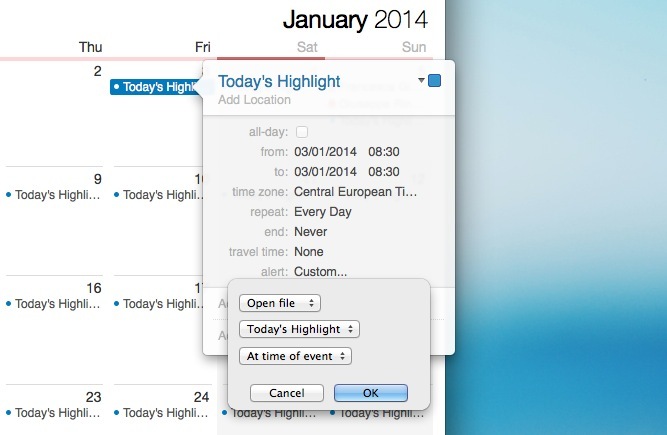 The simplest (and which gives you more control) is using your Mac’s calendar. What you need is a daily event in a local On My Mac calendar — you don’t want the event to be synced across your iCloud devices and stuff like that. Let’s do it. Here’s a how to make a local calendar: open your Mac’s Calendar app and go the Preferences, disable temporarily every iCloud or Google account, then close the Preferences and create a new calendar (via the file menu or right clicking on the calendars’ sidebar). Now create a new daily morning event and as an alert select Custom…, then Open file; finally select Today’s Highlight.app and At time of event (see screenshot below). You can re-enable your synced calendars and hide the local one (you don’t have to see the event of course, it just needs to be there). That’s it! There’s no step 5. Just a quick note: after you finish reading a book, it could be wise to repeat steps 1 and 2 to update your highlights. If you read a lot, just do it once in a while. Thanks again to Ryan Cooper (without his own solution and feedback you wouldn’t be reading this article), and to Simone Fagini, who was kind enough to help me with the Apple Script stuff. Pro tip: if you place Today’s Highlight.app in your Dock, you can click it now and then to push some inspiration to your inbox right away. Scritto da Fabrizio Rinaldi il 5/1/2014 in Tutorials & Tips.